Oklahoma City Thunder star Russell Westbrook claimed racial taunts sparked his heated exchange with a Utah Jazz fan. 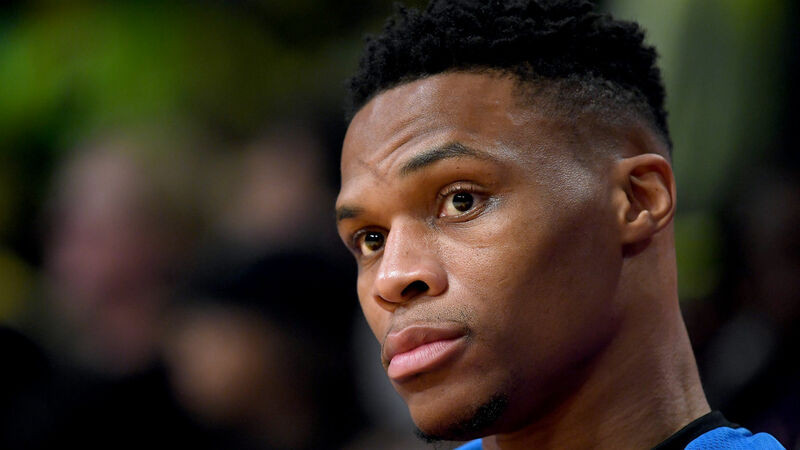 Westbrook was captured on video screaming "I'll f*** you up, you and your wife" to hecklers during the Thunder's 98-89 NBA win over the Jazz on Monday. After the game, Thunder guard Westbrook spoke to reporters and revealed what happened. "The realisation of it is how it started is the young man with his wife in the stands told me to get down on my knees like you're used to. To me, that's completely disrespectful," said Westbrook, who finished with 23 points and 11 rebounds. "To me, I think it's racial. "I think it's just inappropriate in the sense that there's no protection for the players. I think there are a lot of great fans around the world that like to come to the game and enjoy the game. There are people that come to the game to say mean, disrespectful things about me, my family. For many years, I've done all the right things. I've never done anything to hurt or harm anybody. I've never been in any trouble, never fought a fan. Been in the league 11 years – clean slate, humble. I'll take whatever, all the criticism from everybody. I've been doing the same thing for years. "For me, disrespect will not be taken from me. I completely just sit back sometimes and just take it. That's just one video, but throughout the whole game, since I've been here, especially here in Utah, a lot of disrespectful things have been said. For me, I'm just not going to continue to take disrespect for my family. I just think there's got to be something done. There's got to be some consequences for those type of people that come to the game just to say and do whatever they want to say. I don't think it's fair to the players – not just to me, but I don't think it's fair to the players. "And if I had to do it again, I would say the same exact thing, because I truly will stand up for myself, for my family, for my kids, for my wife, for my mom, for my dad every single time. I expect anybody else to do the same. So that's kind of where I'm at with the whole situation. "As for beating up his wife, I have never put my hand on a woman; I never will. Never been in any domestic violence before. Never have before, but once he said the comment, his wife repeated the same thing to me as well. So that's kind of how that started. I know you guys only got the tail end of the video, but the start of the video is way more important and way more disrespectful than what you guys heard. So appreciate y'all." It was not the first time Westbrook has been involved in an altercation in Utah. He appeared to swat the phone out of a fan's hand following a loss in game six of the Thunder's first-round series against the Jazz last season. The Jazz released a statement, which read: "Players and fans have a shared responsibility to create a safe and respectful environment. If it is determined that any fans violated the NBA Code of Conduct, appropriate action will be taken."